One of the first things you need to do when you are looking at your community footprint is to look for your community. What is that, to you, in your business. Wessex FM, Steve and his team travel 130 miles a year in their branded vehicles covering Dorchester, Bridport, Weymouth, Portland and Wareham. They attend 340 events every year; not for profit but to support the community and they air 33k mentions of community related events. Wessex FM was bought by the UKRD Group in June 2009. The Company believes in truly local radio, and while many radio operators are reducing their local content in favour of more regional and national programming, Wessex FM operates 24 hours a day from studios in Dorchester. Their radio broadcasts and advertising packages are absolutely related to the communities they serve. As important as the customer is to WessexFM – the internal community is more so. By looking after the internal community, the real customer benefits, when the real customer benefits the business grows. Proof of the community spirit within the organisation lies in the fact the radio group beat thousands of other companies to win the number one position in the Top 100 list revealed by The Sunday Times. What’s more; this is the third year running. Independent inspectors spent months scrutinising managers and staff. The results saw the company ranked ‘outstanding’ in almost every key indicator used by judges. In addition to being ranked first overall, the company also topped the tables for ‘Personal Growth’, ‘My Manager’, ‘My Team’. This is an immense achievement for Wessex FM. Thanks to the dedication of the staff they have been ranked number one, ahead of some of country’s biggest companies including other high flyers Admiral Insurance, Expedia, TGI Fridays, and the BMW Group. Working with these values creates a culture that provides all staff with an opportunity to make a real difference to the company. A happy workforce means that when the presenters are on-air they will be performing at their best, making it a far more enjoyable experience for the listener, likewise the sales and marketing team will deliver a far higher level of service to the local businesses that they work with. Of course, there are always difficult days when things don’t go quite as well as they might. To give everyone a voice, they have established a concept called courageous conversations. When someone mentions they would like a courageous conversation it triggers an open, honest, fair and professional refection on how they feel about the situation. When differences can be aired confidently and without fear of retribution, disputes and grudges are negated. Top mid size employer for the third year in a row and profitable to boot. There has got to be something in it. What do you think? 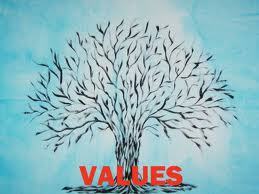 How can you apply the power of values in your business even as an entrepreneur?